Today, Japan Times posted a picture of the current state of construction on the enclosure around the unit #1 reactor building. It is hardly the “makeshift tent” professed by many western news sources. TEPCO expects to be finished by mid-late October. Today's TEPCO report on airborne activity at the Fukushima Daiichi property boundary shows no detectable Cesium in the air. In addition, a Mainichi Shimbun report says samples taken at two openings above the roof on the unit #2 reactor building show airborne Cesium activity between 1/10,000 and 1/100,000 Becquerels per cubic centimeter, which is 100 to 1000 times less (respectively) than Japanese limits for radioactive releases. We have been waiting for a Japanese news media source to make an announcement like this since the end of August, when the levels at the plant site began dropping below the limits. It's about time! TEPCO posts the airborne levels almost every day, so this has hardly been a case of less-than-transparent disclosure...not this time, anyway. Asahi Shimbun reports Tsukuba University professor Yuichi Onda and researchers at the Meteorological Research Institute have studied the material on the floor of Fukushima Prefecture forests. They found that 90% of the Cesium in deciduous forests is on the fallen leaves and upper decaying material, and only 10% has made its way into the soil below. They also found that old evergreen forests have 50% of the Cesium in the fallen needles and decaying material, and 50% in the soils. The team feels removal of the loose surface material should be undertaken first, then the soils should be checked to see if soil-surface-skimming will really be needed. Careful removal and burial of this loose material would reduce radiation levels in and around parks and forested residences considerably, and expedite getting people back home. Former P.M. Kan is at it again. Kyodo News reports on his continued insistence that the specter of evacuating Tokyo changed his mind about nukes. He says that a computer simulation given to him on March 13 showed that radiation releases from Fukushima might force evacuations as far as 200-250km from the power complex, which would mean he would have had to evacuate Tokyo. Kan said he felt this was a valid possibility over the following ten days, during which he created the mental scenario of Fukushima causing “Japan to end as a State.” What's most disturbing about Kan's doomsday assertion is that he ignored all other computer projections about airborne activity dispersal and the possibilities of meltdowns, but literally hung his judgmental hat on the single-most extreme and improbable one. Later in the article, Kan re-implies that he did everything he could to have unit #1 depressurized on March 12, but no-one at TEPCO or in the Fukushima control room was listening. He makes it seem as if his flying to the site the morning of the 12th made the venting happen, which is a complete fabrication (based on control room records). He further re-iterated that he stopped TEPCO from completely abandoning Fukushima on March 15, which the existing record shows to be a rumor-predicated fabrication. To a politician, any publicity is good publicity. His false allegations and contradictory statements are keeping him in the Japanese news, and providing fodder for the western news media to spin on. Kan is effectively becoming an anti-nuclear political shill. Fresh produce in Fukushima Prefecture is now being shunned by consumers. The Yomiuri Shimbun reports that autumn sales of Fukushima produce, especially mushrooms, have only been a third of what is typical. It doesn't seem to matter if the items are grown in other Prefectures and shipped into Fukushima for sale. In addition, having official radiation levels in the food posted to prove its safety has no effect. Literally, there is little trust in fresh produce sold in Fukushima. Further, it's not only happening in Fukushima Prefecture. Foods in Yamagata Prefecture (over 100km west of Fukushima) have also taken a serious downturn in sales...including those that haven't a trace of Fukushima isotopes. The cause of this tacit consumer boycott? Fear of radiation, says Kyodo News. Something similar happened in southern Honshu Prefectures after the bombings of Hiroshima/Nagasaki, and the atomic tests in the South Pacific more than half a century ago. It's a phobic fear of radiation. Kyodo News reports that 80 of the 400 members of the Bavarian Opera have refused to make their tour of Japan out of fears of radiation from Fukushima. In order to avoid losing all performers, the company will ship tons of spring water from Germany to ensure their drinking water is “safe”, and have health physics professionals accompany the entourage to monitor all foods for contamination before eating. While there is no actual risk to the performers, their fears can be directly traced to the current fear-of-radiation politics in Germany. In a related Kyodo report, Siemens, the largest nuclear construction group in Germany, has announced it is terminating it's nuclear division and expanding its fossil fuel division. They say it is in order to stay in line with the recent government decision to stop all nuclear generation of electricity and go forward with fossil fuels. Kyodo News also reports an annual fireworks display at the city hall in Nisshin, Japan, was negatively affected because the fireworks were made in Fukushima Prefecture. The City of Nisshin said they received protests from “about 20” citizens complaining of fears of Fukushima radiation being spread by the fireworks, causing fallout over their radiation-clean city. Since they had no way to prove the fireworks were not contaminated, and fearing wide-spread negative publicity, the city felt they had to re-schedule and use locally-produced fireworks. The re-scheduled display was attended by 110,000 people. Nearly all Japanese news media have posted a version of the story. Yet none, including the U.N. Report itself, mention the Fukushima control room (MCR) records, released in July, which show that despite inadequate accident prevention measures, all meltdown and hydrogen explosions could have been avoided. Procedural restrictions, naïve bureaucratic decisions, and over-confidence in the containment structure's toughness, combined to delay the depressurization of unit #1 for eight or more hours. This delay resulted in the unit #1 meltdown and the hydrogen explosion which doomed units #2 and #3. Without the delay, it is likely all meltdowns and hydrogen explosions would not have happened. In addition to the above, JAIF reports JAEA (Japan Atomic Energy Agency) computer simulations show that if venting and the restart of cooling water flow to unit #2 would have happened 4 hours sooner, it's meltdown would have been averted. This 4-hour-earlier recovery action would have kept the fuel cell below 1,200 oC, avoiding hydrogen generation and cladding damage, and (of course) meltdown. Group leader Masashi Hirano says that he wonders why TEPCO did not start injecting water earlier despite their power difficulties. TEPCO says it doesn't believe the operation was delayed, adding that workers did their best amid high radiation levels and other severe conditions. TEPCO reports analyses of 13 locations inside the seawater break-wall (quay) for Cesium. Currently, only two show Cesium levels slightly above Japan's standards, 3 below standards and six locations are non-detectable. We believe the Cesium is being chemically bound to minerals in the seawater and the resulting products are precipitating onto the sea bed inside the quay. TEPCO's atmospheric readings show levels 1000 to 10,000 times lower than health standards for airborne Cesium. No...that is not a typo! So much for the allegations that massive radiation is still leaking out of the plant! Kyodo News reports Yuichi Moriguchi, a professor at the University of Tokyo, saying up to 2,000 square kilometers of Fukushima Prefecture need de-contamination. He also says 70% of that land area is forest. Using the government-published radiation map, Moriguchi identified the areas having a 1 msv/hr or higher exposure rate. He estimates that decontaminating everything, including the forests, will create 1 million cubic meters of radioactive waste. The low level waste issue is bubbling up in Japan. Vocal residents don't trust local officials and the local officials don't trust Tokyo. Asahi Shimbun calls for an independent committee of experts to handle the issue. How much of the material will be less radioactive that openly disposed-of coal plant fly ash? We feel most of it would be have lower rad levels than the coal ash but that's merely a guess. In a directly related story, Japan Times says Fukui governor Issei Nishikawa will not extend retsart permission to the 14 idled nukes in his Prefecture, even if they all pass the stress tests. He demands the causes of the Fukushima Daiichi accident be concretely understood, and the lessons learned to result in safety upgrades, before he gives his OK. He also wants the new government to create a rule on how long reactors more than 40 years old should be allowed to continue operation. Nishikawa criticized how the nuclear crisis was handled under Prime Minister Naoto Kan and the abrupt introduction of reactor stress tests, saying they were done in an "impromptu" manner. Japan's newest 43 page report to the IAEA on the accident at Fukushima (Additional Report of the Japanese Government to the IAEA; September 2011) is full of typographic errors and abundant with less-than-full-disclosure statements. The volume of examples is nigh-legion. How about one example of each? (1) Typo = Page 5 says Isolation Cooling Condenser operation for unit #1 was stopped before the tsunami hit because RPV temperature was too high. The statement is contradictory on the surface (shut off cooling because it's too hot?? ), but a check of #2 MCR records shows the shutdown was in order to control RPV pressure. (2) Less-then-full-disclosure = Page 8 - on unit #2 “venting” of containment pressure - identifies the operator's efforts to make it happen, but never mentions that all efforts failed and unit #2 was never operator-vented! The severe loss of primary containment integrity at ~6am on March 14, is what caused the depressurization. The operators had nothing to do with it! A Mainichi Shimbun articles alleges that the unit #4 hydrogen explosion on March 15 may have been caused by the generation of hydrogen from the spent fuel pool. Hydrogen and Oxygen are separated from each other in water when in a Gamma radiation field (radiolysis). The group of researchers from the University of Tokyo and the Japan Atomic Energy Agency say spent fuel pool radiolysis might have been the critical reason for the explosion. TEPCO maintains the explosion was due to Hydrogen that leaked from unit #3, and we agree. There are two problems with the new claim, based on what's written in the Mainichi article. First, the concentration of Hydrogen needed for detonation in air is not 4% (as the article claims). NASA's Hydrogen Safety Manual says it's at least 15% for a dry air environment. 4% is the ignition level in the presence of a spark, but burning alone would not have blown the refueling deck apart. Second, the sheer volume of hydrogen needed for detonation in an open space as large as the refueling deck (more than 250,000 square feet) is enormous. While there was certainly some Hydrogen radiolysis in the #4 SPF between March 11 and 15, the volume had to be at least thousands of times less than needed to produce a 15% concentration. Thus, the SPF's Hydrogen may have exacerbated the detonation a tiny bit, but it was neither the cause nor a significant contributor to its magnitude. JAIF, NHK World, and Mainichi Shimbun report on yet another example of informational non-transparency in Japan. The Japanese House of Representatives Special Committee on Promotion of Science and Technology and Innovation ordered TEPCO to submit their official nuclear emergency procedure manuals nearly two weeks ago. Last week's submittal was “heavily redacted”, meaning most of the information in the manuals had been blacked out. When ordered to resubmit by the committee, TEPCO (on Monday) handed in a three-page copy of the index of actions to be taken in an emergency. Nearly everything is blacked out. In fact, only two entries in the index were not blacked out; “firefighting” and “inert gasses”. In addition, while NISA has the legal authority to force TEPCO to submit unredacted material, they have done nothing of the sort. Mainici Shimbun quoted one outraged committee member, "It is unacceptable for TEPCO to refuse to disclose these materials in the wake of this kind of disaster," committee chair Hiroshi Kawauchi said. "Furthermore, the fact that NISA knew there were legal grounds to demand the documents' disclosure but did nothing about it angered many of the committee directors." In response, the Mainichi quotes a TEPCO representative, "These manuals are entirely internal documents pertaining to the operation of the reactors. They are not for general publication. The issue here is the protection of nuclear materials, and our intellectual property rights." No...the issue is the smell of a cover-up, whether or not one actually exists. Protection of nuclear materials? Intellectual property rights? When will TEPCO learn what "transparency" means? In what seems to be a reversal of his prior position on the issue, former P.M. Naoto Kan has called for an overhaul of the nation's spent fuel policy. Specifically, he wants Tokyo to create a promotional policy for the recycling of spent fuel. Kan says France has offered to reprocess all of Japan's spent fuel and produce new fuel cells out of the recycled material. He wants Japan to accelerate is own reprocessing program in order to become a leader in research and development. This seems at odds with his shutdown of Japan's reprocessing project at Rokkasho, Aomori Prefecture, after March 11. In a related story, Mainichi Shimbun reports the governor of Shizouka Prefecture, Heita Kawakatsu, has gone on record demanding that the nation's spent fuel problem be resolved before he gives permission to restart any nuclear plant in his domain. In other words, passing government-mandated safety tests won't be enough to get his prefecture's nukes restarted. Will other governors follow suit? NHK World tells us that one of the 5 municipalities located between 20 and 30km of Fukushima Daiichi has taken the decontamination bull by the horns. The municipality is located southwest of Fukushima power complex, in a region with relatively low contamination levels. The village of Kawauchi has submitted a plan to decontaminate its locale in the hope of enticing the return the 2,800 villagers who have left. More than 300 residents have not evacuated. Local governments must submit recovery plans as a condition for the central government to rescind voluntary emergency evacuation requirements. This is the first municipality to comply with Tokyo's mandate. In addition to decontaminating their portion of the 20-30km zone, they will build new housing for the 350 residents who lived just inside the 20km no-go zone. Japan Times has front-paged the latest pie-in-the-sky report from Greenpeace. Greenpeace says Japan can completely shut down all of its nukes within a year, restart none, and replace them with solar and wind farms by 2020. This would require building numerous liquid natural gas (LNG) power plants (~10,000 Mwe) and stretch the existing Japanese “thermal” (i.e. fossil fueled) capacity to its operational limits. In other words, Greenpeace advocates the release of greenhouse gasses, and wants their superstition-based risks of nuclear replaced with the real risks of global warming. This position alone entirely contradicts everything Greenpeace stands for with respect to global warming. But, their fairy tale doesn't end there. Total nuclear capacity in Japan is about 45,000 Mwe, so the suggested 10,000 Mwe of LNG capacity just scratches the surface. While their dream of 6,000 Mwe of new wind and 7,000 Mwe of new solar are built over the next 10 years, the Japanese people “merely” have to conserve another 17% in electricity consumption beyond the voluntary 21% reduction they already experience. And, there can be no increase in demand whatsoever, virtually dooming any hope of Japanese business and industry growth over the period. Further, the 6,000 Mwe wind farm would cover about 400 square kilometers and the 7,000 Mwe solar farm another 700 km2. This would make 1,100 km2 of Japan essentially uninhabitable for decades, if not longer...which is more than the 800km. of theoretically uninhabitable area due to Fukushima. We are proponents of nuclear and renewables, as well as the total elimination of fossil fuels, to make electricity. We are also proponents of rationality and realism. What Greenpeace proposes is irrational, unrealistic, and contradicts their position on fossil fuel burning. Not to mention the possible collapse of the third largest economy on Earth. Japan Times reports on a man in Iitate who has not evacuated. Iitate is 39km. northwest of Fukushima Daiichi and inside of the government's high contamination evacuation corridor. Nobuyoshi Ito says he does not believe much of what the government or the Press say about the risks of low level radiation. "There are two camps when it comes to the effects of radiation: the antinuclear folk, who tell us even a small dose of radiation is dangerous to human health, and others who say even much higher doses contain less cancer risk than that caused by such factors as smoking or even food. I decided to become a human guinea pig to help settle the argument." Ito believes what the National Institute on Radiological Sciences (NIRS) reports, which say there is no evidence of negative health effects below 100 millisieverts of exposure per year. Ito estimates his exposure will be no more than 25 millisieverts over the next year. Thus, he does not feel his health will be threatened. He is also growing a vegetable garden, and having the produce tested for Cesium absorption. So far, nothing has been detected. Ito has also grown some sunflowers, which are believed to be a way of decontaminating soils. But, he says tests on the plants and seeds show a Cesium concentration 3 times less than the soil itself, making the sunflower-absorption solution seem questionable at best. To correct a previous update...when it was announced that water injection into #3 RPV was lowered to 5 tons per hour, we stated this was total cooling flow. It is not. As it turns out, there are about 3 tons/hr being injected through its feedwater spray piping and 5 tons/hr through the main feedwater piping. The announced reduction in flow was through the main feedwater piping only. The combined flow has dropped RPV temperatures and kept the bottom head at below 100 oC. JAIF and NHK World report that the total volume of contaminated waters in the Fukushima building basements had dropped to ~80,000 tons. Meanwhile, the volume of decontaminated waters is now 85,000 tons. This shows that the two waste water clean-up systems have been working very well since SARRY (the newer system) was started. Some Japanese Press add the 20,000 tons currently stored in various tanks and storage facilities at Fukushima to the total remaining to be deconned. But, it's the radioactive waters in the building's basements that are hampering restoration efforts, not the waters stored elsewhere. Regardless, at the current RPV water injection rates of ~360 tons per day, there is now more than 7 months supply of decontaminated injection water in storage. 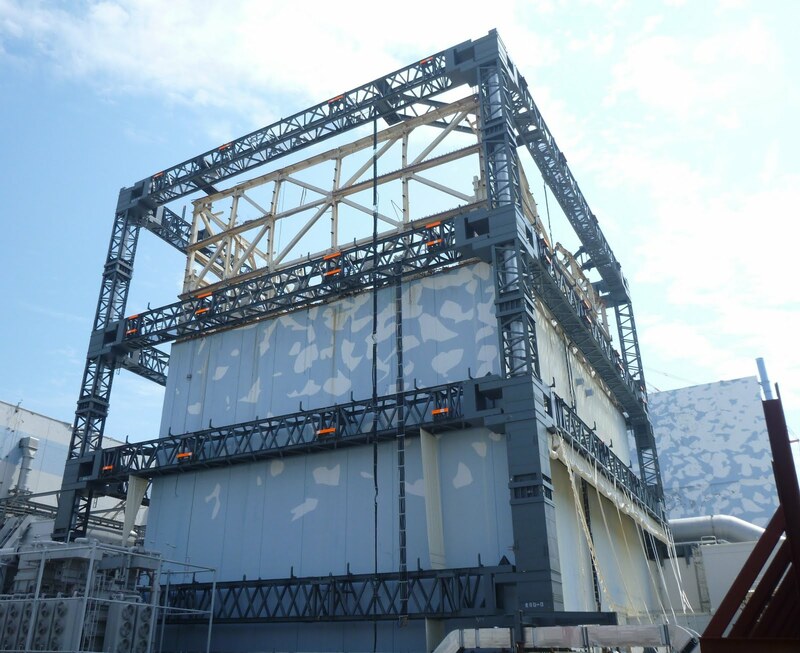 TEPCO has finished the steel framework for the heavy-duty plastic enclosure around reactor building #1. Completion of the structure to seal off the atmosphere from any possible unit #1 airborne releases, is scheduled for the end of October. Once unit #1 is “wrapped up”, work will begin work providing units #3&4 with the same sort of enclosure. Kyodo News has posted a picture of the unit #1 framework, and we are impressed with it's robust construction. NHK World reports a prestigious world nuclear conference has begun in Fukushima Prefecture. Representatives from many reputable expert groups are in attendance, including the U.N.'s International Atomic Energy Agency (IAEA) and International Council on Radiation Protection (ICRP). World Health Organization Director-General Margaret Chan sent a video which was shown at the opening of the conference, calling for creating effective methods to educate the world's public on the risks of radiation exposure. ICRP Vice Chair Abel Julio Gonzalez supported Chan's point saying misinformation, such as internal exposure being more hazardous than external exposure, must be countered and corrected. The conference will also address the misleading notion that the risks of exposures below 100 msv are unknown, which seems to be the main concept behind radiation fears in Japan. Another case of the misleading headline...Japan Times' “Cesium absorption through roots may have long-term effect on farming”. The first half of the article focuses on rumors voiced by local citizen's because Cesium in the soil can be absorbed by plant roots and enter the vegetation. Later in the article, Japan Times says as time passes the Cesium becomes organically “fixed” in the soil and is no longer available for root absorption. The peak period of root absorption is six months after the Cesium is deposited, with the absorption rate diminishing thereafter. This phenomena was “discovered” in the soils surrounding Chernobyl in 1987. While the peak period of absorption should be right now, vegetation samples show that Cesium levels have been dropping the past two months. Since Cesium binds well with clay, and much of northern Japan's topsoil is rich in clay, the rate of binding seems faster than the soils around Chernobyl. At this rate, nearly all Cesium will be “bound” early next year. Near the end of the report we find, “Whether absorption by plant roots can affect human health remains to be seen.” Now, compare it to the headline (above). JAIF reports Gakushuin University Professor Yasuyuki Muramatsu says Cesium in forest soils and fallen leaves is easily absorbed by mushrooms and other edible plants. He says wild animals like boars amass high levels of radiation by eating the contaminated foods. The professor adds that detailed studies should be carried out because wild boars across Europe have been affected by the Chernobyl accident. Muramatsu fails to mention that European boars are thriving even though they have detectable Chernobyl Cesium levels in them. Their numbers are actually increasing because fewer people hunt them due to fear of radiation. In the two weeks after Naoto Kan resigned as Prime Minister, it seems national opinion is swinging away from Kan's nuclear policies. Japan Today reports a slight majority has emerged that believes nuclear powered-electricity is necessary for Japan to recover from the earthquake/tsunami disaster, and to recuperate Japan's economy. Many survey respondents conceded that while nuclear energy might represent risks far into the future, electrical shortages are a real and present issue. Some industrial leaders voiced an even more provocative reason for the shift...over-reaction concerning Fukushima is dissipating. Yoshito Hori, chief executive of management training company Globis Corp, says “The panic is starting to calm down.” He predicts all of Japan’s reactors will eventually return to service, with the exception of Fukushima and possibly Hamaoka. Japan Today also reports only 4 of the 31 municipalities hardest hit by the earthquake and tsunami have created disaster recovery plans. “The scale of the disaster, the national government’s slow response and quarrels among residents have delayed the rebuilding process”, the paper says. The Red Cross says, at this rate disaster recovery along the northeast coast of Honshu will take more than five years. There was no mention of blaming the Fukushima accident in the article, and there should not have been. Kyodo News reports thirteen currently-idled nuke plants are undergoing the stress tests required for restart. Six of the plant-specific data submittals to the government are planned by the end of the month. The other seven early next month. This is a significant acceleration of the data submittal time-table, probably because the new Prime Minister has voiced support for restarts if the power plants pass their individual safety checks. Operational staffs at all 13 units have been gathering data and making on-site inspections relative to withstanding earthquakes and tsunamis since July. The utilities that own the 13 plants now feel they can anticipate restarts as early as the end of the year, rather than the next-spring time-table voiced continually by former P.M. Kan and his Cabinet. Passing the stress tests is but one of the barriers to be surmounted before restarts can occur. After passing the tests, each power plant must also get the OK from their local governments. In a related Japan Times article, Nobel Laureate Kenzaburo Oe has told the paper he completely opposes restarting any of the idled nukes, no matter what. He received his Nobel Prize for Literature in 1993 for his books on Hiroshima and Nagasaki atomic bombings. He says he wants a petition to never restart the nukes signed by 10 million Japanese, to be submitted in March. He calls Fukushima “a third atomic bombing”, which is an attempt to connect bombs with reactors. The Atomic Energy Agency of Japan (JAEA), yet another of the multiple government nuclear authorities, has announced that the area of land contaminated by Fukushima Daiichi is less than a tenth of the area contaminated by Chernobyl. They have used the same grid used last month by the Ministry of Science, Technology, and etc. (MEXT), inside the evacuation zones. They found that approx. 800km2 has contamination levels above the Chernobyl evacuation standards used by the Soviet Union in 1986, rather than the 10,000km2 area that was vacated in the Ukraine and Belarus. While the recent MEXT press release focused almost exclusively on the few small-but-extremely high hot spots discovered, JAEA has used all of its data in compiling its statement. A second JAEA press release says much, if not most of the contamination found in the northwest evacuation corridor was deposited due to heavy rainfall. Asahi Shimbun seems skeptical, but its skepticism is based on ignorance. Cesium is moderately water soluble, and it was the steam/moisture leaking from Fukushima that provided the mechanism for the Cesium to get out. The heavy rainfall on March 15 during two airborne activity peaks, resulted in a large volume of Cesium being literally washed out of the atmosphere and onto the ground to the northwest. In addition, the topography northwest of Fukushima Daiichi is at-first hilly, then becomes mountainous, accelerating the rainfall. The rather rapid increase in elevation further amplified the rain-out. Unfortunately adding to the confusion, JAEA blames the March 15 releases on unit #2, which was venting radioactive material on the 15th. But, the secondary containment building around the reactor was never compromised, making the JAEA speculation questionable. They fail to consider that unit #4 experienced its hydrogen explosion on the 15th, which when combined with the on-going releases from severely damaged units 1&3, is a far more likely release scenario. But, why should anyone be surprised that this information is only now being released? Naoto Kan is no longer Prime Minister, and this information tacitly condemns him and his staff for their errors. They didn't want anyone to know, so they covered it up. New P.M. Noda and his Cabinet have everything to gain and nothing to lose by making this scandal public. As the situation at Fukushima Daiichi continues to improve, the Japanese news media is increasing its focus on radiation exposure stories in order to continue public anxieties. For example, Asahi Shimbun has a lead story under the headline, “Some Fukushima Residents Exposed to Alarming Radiation Levels”. Researchers at Hirosaki University have speculated that thousands of people had exposures of “up to 50 millisieverts”, and a few as high as 68 msv, before Tokyo called for evacuation of the northwest contamination corridor. These values are 2-3 times higher than the 25 msv government emergency exposure standard. Whether or not their speculations have merit, it's literally making a hypothetical mountain out of a realistic mole-hill. While The Asahi calls these numbers “alarming”, the paper fails to consider that there are millions of very healthy people world-wide who experience the same exposures from mother nature every year. In addition, the reported worst-case exposure levels inside the evacuation zones around Fukushima (Okuma Town and the Akougi district of Namie) of 190 msv/yr are below the background levels experienced by the population of Ramsar, Iran, which has been found to be one of the healthiest demographics in that nation. As one friend and colleague recently wrote, “Fear [of radiation] is a powerful tool”. Mainichi Shimbun has posted another lenghty article about the low level radioactive waste issues surrounding Fukushima. This time the paper cites local residents who are afraid that storing the contaminated soils, drainage mud, and grass clippings will contaminate their well waters. It seems they believe that the radiation will pass through the plastic trash bags being used, and make their drinking water supply radioactive. This is a clear case of fear of the unknown. It's the radiation-emitting cesium that's the issue, not the radiation itself. In the first place, Alpha, Beta and Gamma radiation cannot make other things radioactive. Only Neutron radiation can do that. Secondly, the Cesium that's the real issue is chemically quite reactive, so even when it's uncontained in the soil, it doesn't move much, if at all. That's why stripping the top few centimeters of topsoil removes nearly all the Cesium contamination from the dirt. Placing the material in plastic bags is far better than doing nothing at all, at this point. Instead of trying to scare people, the Japanese Press ought to be doing their utmost to educate a frightened population. But wait...that's right...fear is good for for the news business. One of the subtle but significant contributors to the Hiroshima Syndrome is exaggeration. Nuclear exaggerations began when observers at Trinity in July, 1945, described the explosion in apocalyptic terms, and the practice has infected the benign uses of Einstein's idea ever since. However, combining exaggeration with gross confabulation takes us from the merely incorrect to the ethically corrupt. Today's Mainichi Shimbun lead editorial is written by Hiroaki Koide, who is purported by the paper as a radiation metrology and nuclear safety expert at Kyoto University's Research Reactor Institute. While the credentials sound impressive, Kiode has been an admitted nuclear critic for 40 years, and the Research Institute itself has been publishing anti-nuclear reports since 1979. It has never said anything positive about anything nuclear and is openly affiliated with Japan's leading anti-nuke group (Citizen's Nuclear Information Center) and the internationally-infamous Physicians for Social Responsibility. Nuclear Crisis Minister Goshi Hosono told Kyodo News that the government must be rational in setting standards for reactor operational lifespans. “We must create a situation where we can make decisions scientifically," Hosono said. He added that setting a limit based merely on a number [of years] makes little or no sense, especially since nuclear systems do not deteriorate like most other industrial systems due to their low corrosive environment. Hosono said it is "not necessarily scientific" to set a numerical cutoff line for reactors, noting that there are many different types [of reactors and containments]. He adds that while reactors were originally licensed for 30-40 years, many experts believe they can safely operate for 60 years. The first step in setting a “lifetime” criteria will be the much ballyhooed stress tests currently under way. Despite his predecessor's shut-them-down-at-all-costs assertions, Prime Minister Noda is taking a more rational approach to the nuclear energy option. Bloomburg and Japan Times report Noda believes a nuclear phase-out and solar/wind renaissance will take two or more decades. While Noda agrees with former P.M. Kan in principle, he is not interested in throwing out the baby with the bathwater, "It's a realistic option to use existing [nuclear] plants to a certain extent and develop nuclear technology until at least 2030, while aiming to decrease our dependency on atomic power. We will build a framework so we can restart reactors shut for maintenance after ensuring they are safe following stress tests and gaining the understanding of local residents.” He then asserted, "It's important for us to prepare for restarts." With respect to Kan's insistence on the Japanese government officially promoting renewables, Noda believes Japan should increase renewables from the current 9%, to 20% at some point in the 2020s. By combining continued nuclear operations and renewable development he feels, "This crisis has the potential to revive Japanese industries in the long run." But, without the nuclear option, industrial recovery will be doubtful as many industries are threatening to leave Japan because of the energy shortage caused by nukes politically-idled under the Kan regime. Ex-Prime Minister Kan has begun a media blitz to absolve himself of all blame for his actions the first five days of the Fukushima accident, and at the same time set himself up as an anti-nuclear celebrity. This morning, Kan gave no less that three separate interviews to major Japanese news media outlets, in some cases contradicting himself, but in all cases pointing toward his activist vision. Clearly, Kan's personal anti-nuclear crusade has begun. The Mainichi Shimbun reports Chubu University engineering professor Kunihiko Takeda has speculated “Eating vegetables and meat from the Tohoku region will ruin your health," and that "making agricultural products in Tohoku right now is a mistake." He made his comments on a Yomiuri TV show focusing on radioactivity in Iwate Prefecture. Ichinoseki Mayor Osamu Katsube was literally enraged by Takeda's statements, which were broadcast in many areas of the Tohoku region. He sent an angry email to the engineering professor on Sept. 6, in which he called Takeda's claims "thoughtless".